A dinner I made last week. 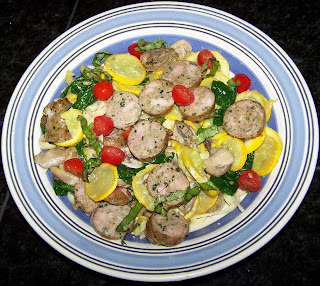 Chicken Sausage with vegetables over linguine with butter & parmesan. For some time now I have been trying several different methods for getting dinner on the table without going crazy. (Imagine frazzled mom trying to cook dinner with a kid hanging on each leg crying and whining because they are hungry , BUT want my undivided attention.) It is hard to strike a balance between fast and healthy. In order to accomplish this I have to be very organized and plan ahead. That means the grocery list and meal planning starts on Thursday for the upcoming week. I look at the Publix ad to see what is on sale. I decide on a couple of meals for the week and I make my list. I have made several dishes in bulk and have them ready in the freezer, which helps too. Then I go through my coupons to see if there are any matches. I usually have to make a trip at some point during the week to Wild Oats for some items that I can't find at Publix. It is still a work in progress, but overall the stress of getting dinner on the table is less than it was 2 months ago. I am going to start posting our dinner menu for the week. It helps me stay organized and keeps me honest too. I am actually publishing this on Sunday, but Menu Monday sounds better and most people will not read it until Monday. That is also why Sunday is included. Wednesday- Margarita Pork Chops (*FFF), Black Bean Salad, and Cheese Quesadillas or rice if there are leftovers. Thank you! Thank You! TY! TY! I don't like to cook dinner but I love eating with my family of 4-Me, dad, 9yo and 7yo. Your Monday meals posts will be great for me to follow! I hope you don't mind me stealing your recipes and your dinner ideas but with trying to go eco-friendly and running a family I barely have time. Again, a big thank you! Please feel free to use any of my recipes or dinner ideas. It is all still a work in progress. I guess it always will be.